Darin Strauss’s sad and somber gift to others from his suffering: stunning in its artistry, honesty. Half a Life: A Memoir by Darin Strauss. Random House, 187 pp. 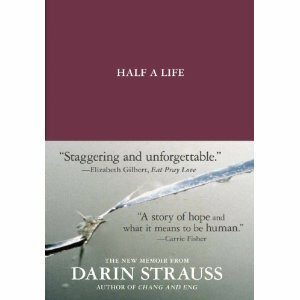 I was surprised—but pleased—when Darin Strauss’s memoir Half A Life recently won the 2011 National Book Critics Circle award for autobiography. I hadn’t heard much buzz about the book. The judges called it a “brave and heartbreaking account,” placing it ahead of finalists that included Patti Smith’s National Book Award-winning memoir Just Kids. Half a Life may be the saddest book I’ve ever read. Which, I hasten to add, doesn’t mean depressing, not exactly. More like sad, and haunting, but mesmerizing. I was in awe of the book and its execution when I read it in early winter, but didn’t write anything because I just didn’t know what to say. I decided to read it again, but haven’t yet. I will, though, at least when it’s in paperback so that I can use it in a memoir readings or writing class. Strauss was only eighteen when he was driving himself and some friends to play miniature golf; a girl from his school turned her bicycle in front of his car, his parents’ Oldsmobile. There was no way to avoid hitting her. None. She died, and he’d never be the same. The horror of this situation keeps resonating as you see Strauss try to live with it. He’d accidentally violated one of our species’ deepest taboos, taking another human life. Contemplating his plight, across 200 pages, is uncomfortable. Like watching a slow-motion wreck. Strauss manages a deft, complex then-now dual persona: the stunned high schooler who has just killed a classmate and cannot help worrying how he’s coming off; the man of 36—his being altered and shaped by what happened half a lifetime ago—who writes the story in hopes of exorcism. He’s appalled by that kid yet also aware of how deeply in shock young Darin was. Who knows the hard, broken road ahead of him. How it will almost kill him—physically, for it certainly killed the boy he was before that split second—and how it will colonize his psyche. An old man clamped his eyes on me as if he wanted to cut my heart out. Imagine outliving not only your children, but your grandchildren. The man was frail, with the body—slim hips, short, a big belly—of a schoolgirl eight months into a mistake. He stood to the left of my path and didn’t move; my father and I had to glide around him. His head revolved carefully, never releasing me from the grip of his gaze. I turned and looked—my father had, too—and the man kept staring. (I now think tears don’t mean anything so much as overload. You don’t know what you feel. So tears spill out.) . . . In the long moment before he found words, and as he took my hand, Mr. Zilke settled on an expression, a hard-won glint of: I will be friendlier than you have any right to expect me to be. Celine’s mother joined us. (The thing is, I still don’t know what would have been the right and respectful thing to do, other than having shown up.) I think her mother attempted a smile, but not a single muscle obeyed; she stood there exempt from all expression. Then her cheeks flared a difficult color. She was preparing to do something. First, a clenching of her body, a steeling herself for something personally odious. She let out as noise: part sob and sigh, part venom. She hugged me quickly, and just as quickly shrank away. What if I tell you it was windy when I fled the memorial, so that all the trees moaned in protest. Is that puffed up enough, labored and lyrical enough, to seem like something extracted from a novel—and not just a real day of a real boy and a real dead girl? I highly recommend Half A Life, a top-five memoir. It is a generous gift, this book; though a work of art, not a self-help book, it might help others deal with impossible burdens. And Strauss never spares himself. He points out when he shut down and felt less than he might have or tried to make himself look better in the maelstrom after the crash. But he took to heart her mother’s injunction—a curse, really—that he must now live life for her daughter, too. The parents, who said they didn’t blame him, were soon suing him for millions of dollars. The carefree under-achiever became serious, studious, anxious, sad. The wreck made him a writer—he first published three literary novels—and changed him in almost unfathomable ways. He mostly hid his shameful secret from others, though he thought about the dead girl constantly. In college, he went to the library regularly and obsessively figured out the physics of the crash to prove to himself, over and over, that he could not have avoided her. After college he tells a few girlfriends, with mixed and volatile results. Finally, he marries. And ultimately his wife, pregnant with twins, insists that he come to better terms with the accident. She senses it’s always present, always coming between them. My accident was the deepest part of my life, and the second-deepest was hiding it. Half A Life, emotionally restrained and rather somber, is the result of his coming clean. But the wound has so forged him that there’s no way he can just will himself to get it out of his system and get happy. The accident made Strauss who he is; it is inseparable from his identity. His memoir documents his efforts to do the right thing from the moment of the accident; it is also, in its honesty and artfulness, inescapable evidence of transcendence. Thanks so much for reading and commenting, Darin. Your book did and does mean a lot to me, and I can’t wait until it’s in paperback so students can read it. It reminds me very much of Conrad’s great novel Lord Jim. Thanks, Richard, for a good synopsis and snapshot of a book that I didn’t think I wanted to read but now do. It’s frankly refreshing not to have to plow through a formal, literary review, so many of which I find tiring. And I often don’t trust the reviews on Amazon. I, btw, recommended your blog to a young writer I met and she told me she gobbled it up. Thanks so much, David. I do think my offhand reviews are better than when I gear up and try to do a Review. The latter doesn’t really fit most blogs, for one thing. The kind of thing you’d tell a friend is what I hope more of my reviews will be. I read about this book when it came out. In all the Egan fury, I missed that it won. Enjoyed your post.